Topping, Jane (2015) The Fisher Street social. [Show/Exhibition] In: The Fisher Street Social, 1-4 August 2015, Carlisle, UK. Jane Topping's work featured in 'The Fisher Street Social', a group exhibition of contemporary fine art, curated by the Fisher Street Collective. 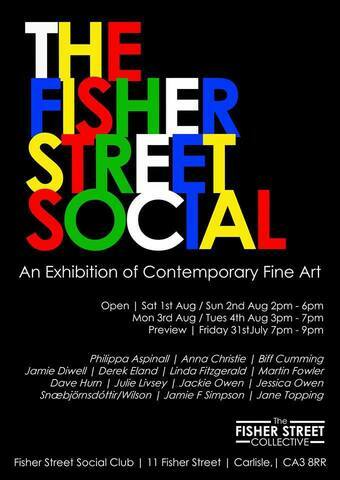 The Fisher Street Collective is a group of artists based at the Working Men's Club on Fisher Street, Carlisle, UK.